I just got back from my local music radio show on internet only Wbkm Dot Org. I had a fun idea for a theme and pulled it off nicely. From our small city to the great big word, these are the Sounds Of Burlington. Tonight I will speak a bit about the expanding and contracting nature of music, but on this cool autumn night, if you want to go for a walk, it would be good to put on your overcoat. 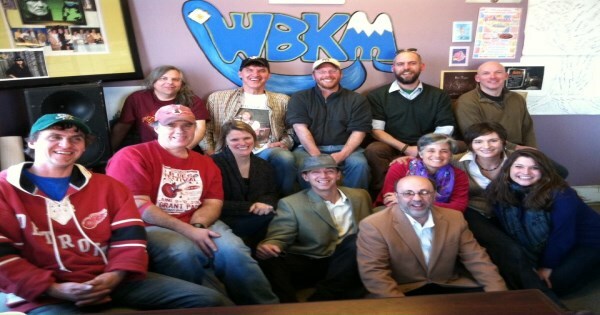 This is Swale on Wbkm, and this is Burlington’s Kind Of Music. And The Kids played a killer set at The Monkey House last Monday. Lots of Burlington’s finest musicians were there in the audience, including Josh. I really liked that song that I got from his http://jglassmusic.bandcamp.com/album/demos page. This time of the year always makes me think of the Swale song. Last week, I finished the last song from Zola Turn’s Ninja Jane. The next album I will play all the way through, one song per week, is the EP Row from Anachronist. Phil and the band are playing two sets at the 4 Quarters brewery, in Winooski, tomorrow. The second set could be “interesting”. They start at 7. Swale’s 12th birthday party with And The Kids at Radio Bean is tomorrow at 9. It will be tough to make both with that timing. Also Gregory Douglas and Josh Glass are playing tomorrow in Winooski at Oak 45. Great song from Ninja! I caught this next singer last Saturday at Radio Bean. He did a great version of this. Lonestar just announced a show in November at Radio Bean! Yea. I hope that means a Cush show and a Dwellers show if Burette Douglas and Gabrielle Douglas are in town. Friend of the show, Linda is a great musician and a super person. Yesterday, I listened to the end or a radio show from Soho England where THE VACANT LOTS spent a lot of time with the host and played some cool songs including some of their own. This was one they played. Dave used to play all around town and is back in the neighborhood and just played a show in Wilmington with Mark Crowther as ‘Nuther Mother Brothers. It’s great to have them back rocking and I hope they come to town soon. I had to play that song from the Lestons because guitarist Matthew Stephen Perry‘s new band Dino Bravo is playing at Club Metronome at 11, and the Lots started their European tour in Spain. Up next is a suite of songs from a new album I’m trying to wrap my head around. Nice lyrics about starting from roots and growing. Nice ability to be comfortable with almost any musical style. It’s autumn in Vermont. We don’t have Sequoia’s but we have apple trees and it’s harvest season. I think I saw something saying the Lots might play town at the BCA center in October. They are out touring Europe, having songs mixed by Sonic Boom and putting out singles with Alan Vega. Way to live the dream Lots. I did not know the Lestons back in the day, but Matt’s next band, Party Star, used to play that song all the time. If the Cush come back to town, they should have a new album. Here’s one from their last. Milton played a killer version of that last Saturday at Radio Bean. He used a foot pedal to fill out the sound and his voice and guitar to drive the song. Great song from Linda, who also plays trumpet on some of the Phil Yates songs. Great song from Static and Light the new Anachronist album. When they sent me the CD I bought, they tossed in a had written note with a couple of cool drawings. Thanks guys! Back in the ’80’s Ninja had some original songs but played a lot of covers. I love their version of that one. Well, if you’ve paying attention, you know the next song is another from And The Kids. I just got back from seeing Dino Bravo VT at Club Metronome. I finished up the radio show around 11:10 then took the short walk to the club. Dino were all set up, and after a 5 minute wait, they hit the stage. A few years back I chatted with Ornan McLean at an April Wine show at Higher Ground. He was excited to hear an arena rock band in a club. That’s exactly what tonight’s show was. Dino had a huge killer rock sound and made me wish they were opening for Judas Priest at the upcoming Montreal gig, instead of Steel Panther. Dino opened with Sugar Coated Candy Sticks and rocked the small but dedicated crowd hard. Empires followed and Jeff LaBossiere‘s drumming drove it through all it’s changes. Matthew Stephen Perry played his guitar hard and sang with a snarl. Chris Farnsworth‘s leads soared all night long. Josh Shedaker‘s bass playing was locked in with the drums for each songs twists and turns. Chuck Berry was great. They tossed in a ween song. Bottleneck rocked hard and kept us dancing. They played a completely over the top This Is A Song About The Ocean and followed with the twin harmony guitars of Strawberry Blonde. They brought Lily Sickles to sing backup on Pop Music, then she let her voice soar on the closing cover of 20th Century Boy. It was a magnificent show from first note to last. I hope they recorded it. That was one for the records. After the last note I went back to Wbkm Dot Org and grabbed my backpack. There was more music to come, but my time was short, and I caught what I could. 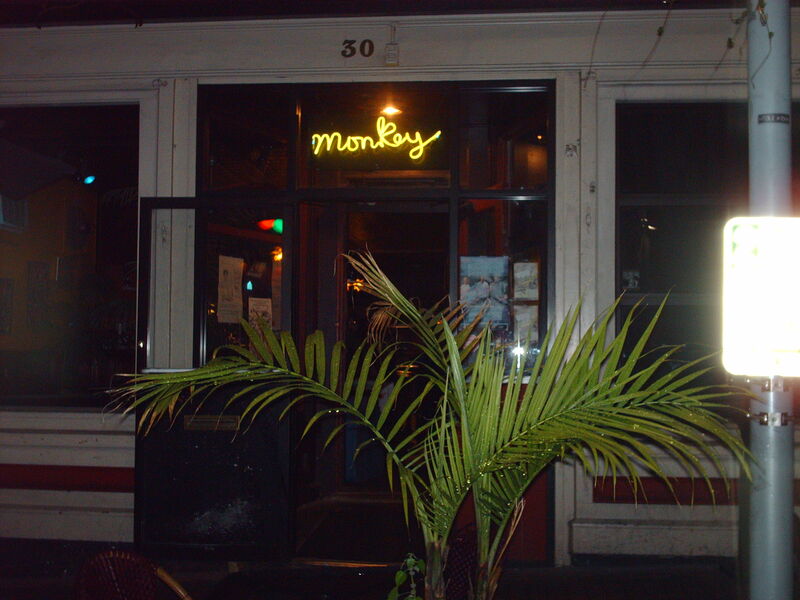 I had a good time seeing music Monday night at The Monkey House. I was on the fence about going, but love the music of And The Kids, so around 8:30 I took the long walk to Winooski. The show was set to start at 8:30, but it was 9:10 when the musicians began to arrive, and turn the empty stage into a rock zone. It was 9:42 when Joey Pizza Slice took the stage and began to croon Moon River. He followed with a set of low-fi indie oddness that has been his trademark for years. A heavily distorted guitar and mic loosed his songs on the appreciative audience. He returned to the crooning for a bit with You Only Live Twice, but most of the show was his own stuff. 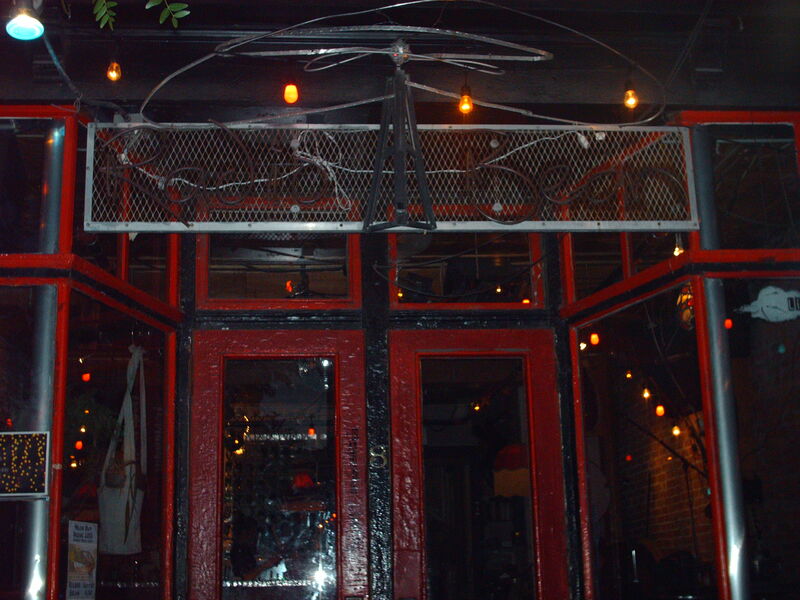 He wrapped it up at 10:05 and DJ L’Enfant Sauvage played some obscure songs on LP’s and 45’s. At 10:25 PC Worship hit the stage with a steady barrage of of sludgy metal. The two electric guitars, bass, drum band started with a swirl of chaos but settled into a groove. They stayed locked in on each song, and the only change in melody was brought out in the vocal lines. The music was heavy, rhythmic, and primal. The was almost no cymbal playing or lead guitar playing, just a river of heavy rock. The woman on drums pounded them with an elated fury. One of the guitar players picked up the sax for the last song, and they wrapped up about 11:00. I had a good time rocking in the groove they made. The DJ came back for a few more songs, and I though And The Kids would follow, but Guerrilla Toss set up next. They hit the stage at 11:25 and played an intense 25 minute set. The singer shouted the lyrics and both she and the bass player spent the show in front of the stage. The guitar, drum, and keyboard players held fort on the stage as glowsticks were thrown to the audience. Their sound was kind of like a heavy fast Beastie Boys. They rocked us hard and we had a great time. After they wrapped up, DJ Disco Phantom laid down some songs as the final band set their stage. And The Kids went on at 12:20 and the majority of the audience had stayed and were happily rocking out. They played great versions of Wiser and Cats Were Born and their songs were like a shimmering light after all of the heaviness. The singer, Hannah, dropped a great line about being honored to open for Guerilla Toss who just played before us. Their 33 minute set was pure bliss and made every effort that I put in to get there, completely worth it. As the last note faded, so did I. The walk home was quick and filled with joy. I had a great time seeing Music on Saturday night. I got out at 5:30, hung out at home for a bit, then took the happy walk to Radio Bean. I arrived just before 7 and got in and settled. Milton Busker already had his acoustic guitar and mic set up, and he took the stage exactly on time. He opened with Ordinary Day and the small but dedicated audience was quiet with appreciation. His next song was a gentle instrumental, and it took a moment to realize the extra keyboardish sound was coming from a foot pedal. He brought the pace up a little with Jesus In Chains, then pulled out the playful All The Same To You. An intense version of Dogs At The Door put me into a state of pure bliss. He followed with a great cover, that I did not know, then pulled out a couple of new songs. I think the first was something about the Devil’s hand, and the second was called Ode To Apathy. Both were quite good. As the set progressed he moved from some very quiet songs, through some nicely mid-tempo ones then pulled out one that was completely over the top. By listening closely to the quiet parts, I was able to soar when he brought guitar and voice through the roof. After that, he played a couple more to wrap up the set, including a sappy song for his wife. His songs are catchy, well written and fun to be around when he is playing them. I’m so glad I put in the effort to go.